Home » Blog » News » NHSLMA. Nashua, New Hampshire. 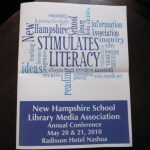 My week in New Hampshire could not have ended better… I spoke at the Annual New Hampshire School Library Media Association conference yesterday. What a fabulous group of librarians! They could not have been kinder and they laughed at all my joke, which I find extremely attractive in librarians. Thank you everyone! I had a great time all week long, but now I’m looking forward to flying west and spending a day on the farm with Marie. I thoroughly enjoyed hearing you speak at the NHSLMA conference. Your keynote was so funny and I loved the breakout session. Thanks for being so willing to share your time with us. Thank you Tracy. I had a great time!